Eronor is a Dunmer herder who takes care of the horses and sheep at Weynon Priory. He is the brother of Dagail, the head of the Leyawiin Mages Guild. He wears a set of lower class clothing: a blacksmith's apron, blacksmith's pants and a pair of rough leather shoes. He is armed with a club and carries two repair hammers and a small amount of gold. Eronor wakes precisely at 6am and immediately leaves to start his day without stopping for breakfast. He heads through the sheep pen and upon reaching the stable, starts pacing between it and the far end of the tunnel under Weynon House. He frequently checks in on the horses, but never for too long before heading back to the entrance to Weynon Priory; perhaps to make sure the other inhabitants don't need him for anything. He will sometimes also head just around the stable to stare past the broken fence at the graveyard. At midnight he finally goes home to Weynon Lodge and is asleep within seconds, again without a meal. The first time you talk to him, he will introduce himself with "I'm the shepherd here. Eronor's the name. And this is Weynon Priory." If you ask him about Jauffre between 10pm and 6am, Eronor will tell you that "He'll be sleeping, like anyone with a lick of sense... in the Priory House." Outside those times he will reply "If he's not sleeping or eating, he'll be fussing with his books, I reckon, over in the Priory House." During the attack on Weynon Priory, you will find Eronor fleeing from the building, and he'll say "Help! You must help! They're killing everyone at Weynon Priory!" If you ask him to slow down and explain what happened, he will reply "I don't know! I think they're right behind me! Prior Maborel is dead!" When asked who's attacking, he explains "I was in the sheepfold when they attacked. I heard the Prior talking to someone. Looked around the corner to see who it was. They looked like travellers, ordinary. Suddenly weapons appeared in their hands and they cut the Prior down before he could move! They saw me watching and I ran." and asked about Jauffre, he will tell you that "I don't know. In the Chapel praying, I think. You must help us!" After things calm down a little, he will ask "Are they gone? Is it safe to come back?" If you ask him for "Assistance" after speaking to Jauffre for the first time, he'll say "Well... I normally stay out of the affairs of the great folk that come through Weynon Priory to see Master Jauffre. But go ahead and take this hammer. You might have use of it, and I have others. Not much call for smith-work around here in any case. Well, we both have better things to do than stand here all day exchanging idle gossip. Good day to you, now." and give you a free repair hammer. Prior Maborel may tell you "Surprised by Eronor's uncanny way with sheep? Perhaps it would interest you to know that Eronor's sister, Dagail, in Leyawiin, is an accomplished spellcrafter." and that "Eronor, a lay brother, tends after the sheep and our little farm." 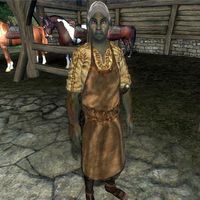 The information that Eronor and Dagail are related is odd since Dagail is a Bosmer, so it's difficult to see how they can be related other than the possibility the two are really half-siblings, or one or both of them were adopted. It also may be that Eronor was supposed to be a Wood Elf, as Dark Elves usually have surnames.